I must confess that I might not have read An Uncertain Glory: India and its Contradictions if it were not for the recent polarized debate on the front pages of India’s English print media. But, I am glad I did read it, for it focuses squarely on many of the challenges India faces today. In 8 Steps to Innovation, Vinay Dabholkar and I emphasized the importance of focusing a firm’s innovation efforts on challenges that matter. To ensure this, we suggested that every firm compile and update what we called a “challenge book,” a set of problems that the firm needs to solve. 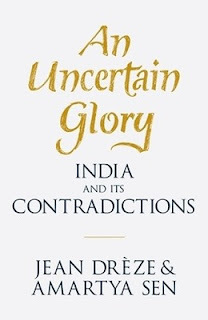 The main virtue that I see in this new book by Jean Dreze and Amartya Sen is that it applies similar thinking at the national level to build a contemporary challenge book for India. In our book, we suggested that pain, wave, and waste are three good starting points to capture these challenges. Dreze and Sen use the available data on reading and writing skills, access to toilets and availability of health services to identify the pains of the hundreds of millions of Indian citizens who have an unacceptably low quality of life. The main question they ask is of what use is our impressive economic growth if we can’t ensure a minimum standard of living and dignity for all our citizens. Amartya Sen has based a lot of his work on the importance of freedoms that allow people to develop and use capabilities. Human potential is wasted when our citizens lack the opportunity to develop the capabilities that would allow them to realize their potential. A wave underlies much of their thinking, but they urge us to ride against this wave rather than go along with it. This is the predominant tendency for public discourse to be obsessed with the concerns of the middle class and the intelligentsia, and to equate the “aam aadmi” with the slightly less advantaged among a privileged class rather than the real “aam aadmi” who spends less than 40 Rupees a day. Though Dreze and Sen focus on problems, they spend considerable space to point out that in our large and heterogeneous country we often have solutions as well. At least three states of India – Kerala, Tamil Nadu, and Himachal Pradesh – have been “bright spots” on a wide range of social indicators. As we pointed out in “8 Steps,” bright spots help identify ideas that are likely to work, and hence give us pointers as to how we can grease the path for innovation to happen. Bright spots also hold out hope that change is indeed possible. But, for bright spots to be useful as role models for change, it is important that they are not outliers with totally different or fortuitous circumstances that can’t be replicated. Kerala was often seen as one such outlier thanks to several idiosyncratic features: the relative progressiveness of the Cochin and Travancore states that ruled the region before independence; the matrilineal traditions of certain parts of the state; and an economy driven by external remittances that has brought in money even though the state has not attracted much investment in industry and commerce. In contrast, clearly, Tamil Nadu and Himachal Pradesh have the potential to inspire fresh thinking in the rest of the country. Tamil Nadu is a large state (I should have known this, but realized only after reading this book, that the state has a population of 70 million – that’s equivalent to the population of the Republic of Korea!) that started off very poor but today is #2 after Kerala on a whole range of social indicators. Himachal may be a small state but its location in north India shows that social progress does not have to be the monopoly of the south. Dreze and Sen also draw attention to a new emerging bright spot – Chhatisgarh - that has recently reformed its Public Distribution System with improved access for all its citizens. Give the diverse backgrounds and histories of these states, it’s difficult to anyone to say that no solutions exist around us. If you have read this post thus far, you are probably beginning to wonder why this book has raised so much controversy. Is it because of the discomfort felt by the Indian middle class when it is pointed out how self-centered we all are? Or is because of the inability of the Indian media to take criticism (Dreze and Sen accuse the media of neglecting the real “aam aadmi” in their quest for TRPs and advertising revenues)? While I am sure there is a bit of both, the lightning rod has been the nature of solutions preferred by Dreze and Sen.
Dreze and Sen point out that in most parts of the world the State plays an important role in providing basic services to the people. They are skeptical about the efficacy of market-based solutions to provide basic needs. They are most vehement about this in the context of health care where they argue that private insurance based solutions tend to result in very expensive care and inadequate coverage. They are similarly skeptical about cash vouchers for education, and direct cash transfers in lieu of the Public Distribution System. They provide some evidence to show that these market-based solutions work well for supplementary services once the basics are in place, but not for providing a base level of support. While Dreze and Sen identify the need for greater accountability and better governance fairly early in the book, they are somewhat idealistic about how this will come about. This is a weakness of the book, for clearly reliable provision of basic services by the State will happen only when the State is more effective. Kerala, Tamil Nadu, Himachal and Chhatisgarh may provide inspiration, but achieving better governance across other states seems a far cry today. I found the book an engaging read. A major plus point of the book is the very informative tables and statistics. I found some of the statistics mind-boggling – e.g. the hold of the upper castes over almost all important institutions in the city of Allahabad, and the abysmal literacy levels among dalits in India in the 1901 census (0% in most provinces). But more than anything else, this book puts a spotlight on the biggest problems India faces today. Thus it is an excellent guide for any sensitive citizen of our country who wishes to contribute to the nation.